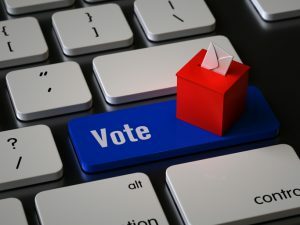 Home / Parking Matters Blog / Get to Your Computer and Vote! Get to Your Computer and Vote! We take great pride in being a very inclusive association. Each year, IPMI seeks input from thousands of volunteers, and we turn their thoughts into efforts to better the industry. Currently, 16 of those volunteers are seeking seats on IPMI’s Board of Directors–and your vote. The Board guides the association’s programs and initiatives while its members serve as volunteer leaders on our committees and projects. Having served on a number of boards myself and seeing how other leadership groups interact, I am always impressed with the way IPMI Board members place their self-interests aside to work for the greater good of the entire parking and mobility community. This doesn’t mean they always agree on everything, but they always find a way to work in a collegial manner to move the institute forward. It’s actually quite a remarkable group to be a part of. The 16 candidates for 7 open seats on the Board have a wealth of knowledge and experience to share, and all you need to do is make sure someone from your organization votes. Click here to review the nominees’ bios and platforms. Polls are open!